CPU P-state/C-state are controlled by the guest OS. The ACPI P/C-state driver relies on some P/C-state-related ACPI data in the guest ACPI table. SOS could run ACPI driver with no problem because it can access native the ACPI table. For UOS though, we need to prepare the corresponding ACPI data for Device Model to build virtual ACPI table. The Px/Cx data includes four ACPI objects: _PCT, _PPC, and _PSS for P-state management, and _CST for C-state management. All these ACPI data must be consistent with the native data because the control method is a kind of pass through. With these Px/Cx data, the Hypervisor is able to intercept guest’s P/C-state requests with desired restrictions. Some ioctl APIs are defined for Device model to query Px/Cx data from SOS VHM. 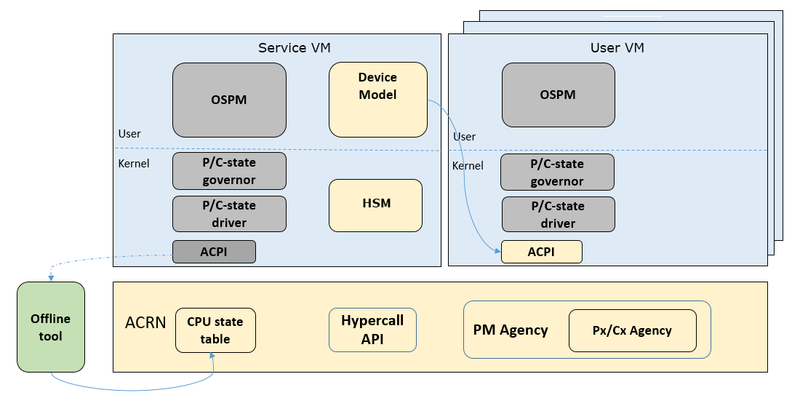 The Hypervisor needs to provide hypercall APIs to transit Px/Cx data from CPU state table to SOS VHM. Use offline tool (e.g. iasl) to parse the Px/Cx data and hard-code to CPU state table in Hypervisor. Hypervisor loads the data after system boot up. Before UOS launching, Device mode queries the Px/Cx data from SOS VHM via ioctl interface. VHM transmits the query request to Hypervisor by hypercall. Hypervisor returns the Px/Cx data. Hypervisor should be able to restrict guest’s P/C-state request, with a user-customized policy. Hypervisor should intercept guest P-state request and validate whether it is a valid P-state. Any invalid P-state (e.g. doesn’t exist in CPU state table) should be rejected. It is better not to intercept C-state request because the trap would impact both power and performance. For P-state control you should pay attention to SoC core voltage domain design when doing P-state measurement. The highest P-state would win if different P-state requests on the cores shared same voltage domain. In this case APERF/MPERF must be used to see what P-state was granted on that core. ACRN assumes guest has complete S3/S5 power state management and follows the ACPI standard exactly. System S3/S5 needs to follow well-defined enter/exit paths and cooperate among different components. Once SOS low power state is done, ACRN HV will go through its own low power state enter path. The whole system is finally put into low power state. The low power state exit process is in reverse order. The ACRN hypervisor is woken up at first. It will go through its own low power state exit path. 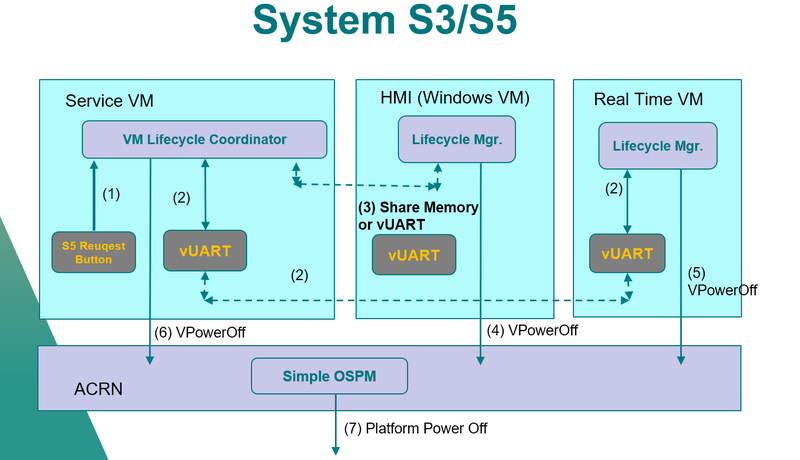 Then ACRN hypervisor will resume the SOS to let SOS go through SOS low power state exit path. After that, the DM is resumed and let UOS go through UOS low power state exit path. The system is resumed to running state after at least one UOS is resumed to running state. ACRN HV pauses SOS VM to emulate SOS S3 and starts ACRN HV S3 entry.